Drew Estate Undercrown is the blue collar Liga Privada 9, created by the factory rollers when due to overwhelming demand, they were stopped from burning the Liga 9. Drew Estate’s master blender, Willy Herrera, challenged the rollers to come up with a blend that would satisfy his palate, and with his input and assistance, the Undercrown Maduro came into being. The San Andres wrapper adds a slight touch of spice to the blend which develops nicely with an array of robust flavors. 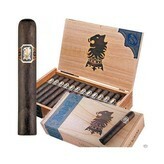 Undercrown is a medium-bodied cigar that packs a punch of flavor that will surely please any Liga Privada fan. Drew Estate Undercrown is the working man’s cigar. Under guidance by master blender Willy Herrera, Undergrown was created by factory workers for their own consumption. The torcedores, or rollers, decided to use a blend for their own cigars with the same tobacco used in several Liga Privada cigars. The Drew Estate Undercrown was awarded an epic 91-rating from Cigar Aficionado magazine’s December 2017 issue! The expertly rolled Undercrown Maduro Toro Negra is a medium-bodied cigar with delicious, unique blends of fine tobacco. Drew Estate’s Undercrown Maduro Toro Negra is wrapped a dark San Andreas Maduro Negra wrapper from Mexico along with Sun Grown Habano binder and Brazilian Mata Fina and Nicaraguan Habano filler tobaccos similar to those of their popular Liga Privada #9. Undercrown Maduro begins with notes of coffee and a touch of spice and licorice that grows more intense as the cigar develops. Undergrown Maduro has a nice draw and even burn, remaining a medium to full-bodied treat throughout the smoke. The medium strength of Undercrown Maduro Negra pairs well with an equally bodied bourbon. Whiskey Row 88 Proof has floral notes, aromas of vanilla and brown sugar with cinnamon and nutmeg spices on the palate. Paired with an Undercrown Maduro, the cigar mellows the sweetness of the bourbon and enhances the spicy flavors. The bourbon also brings out the earthy flavors of the Undercrown Maduro. Together, they balance out each other very well.